Did you know UCR hosts visiting professors and researchers from around the world?! International Research Scholars contribute a wealth of knowledge and experience to UCR’s research enterprise. Join us for a special reception that recognizes the work of a small group of visiting scholars. 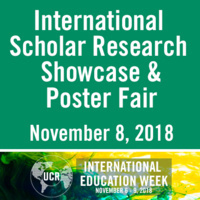 Practice your networking skills and learn more about the research our scholars conduct at UCR during the adjoining poster fair. About International Education Week 2018: "Addressing Global Insecurities"